Why Marxism? Why today? 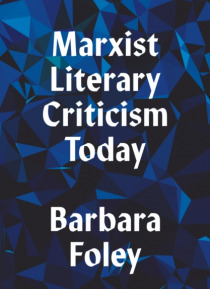 In the first introduction to Marxist literary criticism to be published in decades, Barbara Foley argues that Marxism continues to offer the best framework for exploring the relationship between literature and society.She lays out in clear terms the principal aspects of Marxist methodology - historical materialism, political economy and ideology critique - as well as key de… bates, among Marxists and non-Marxists alike, about the nature of literature and the goals of literary criticism and pedagogy.Foley examines through the empowering lens of Marxism a wide range of texts: from Jane Austen's Pride and Prejudice to E. L. James's Fifty Shades of Grey; from Frederick Douglass's 'What to the Slave Is the Fourth of July?' to Annie Proulx's 'Brokeback Mountain'; from W.B. Yeats's 'The Second Coming' to Claude McKay's 'If We Must Die'.